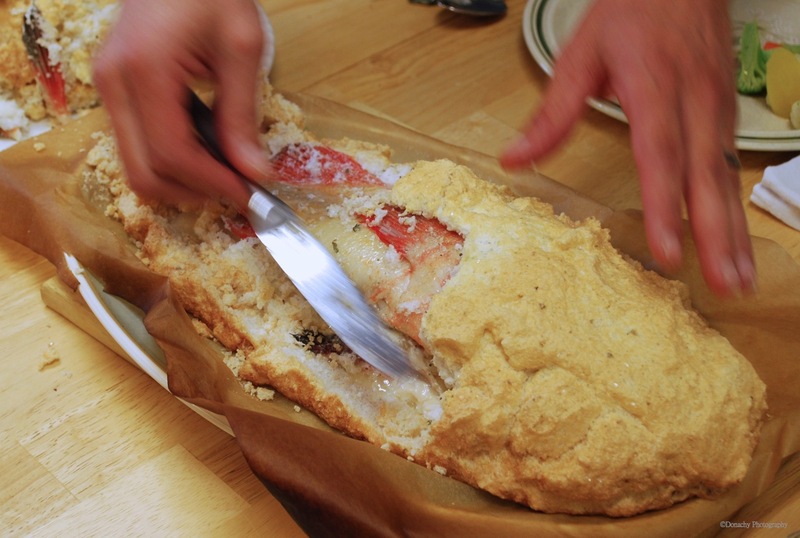 Pesce al Sale – Whole fish baked in a salt crust. I’d read about this simple yet dramatic presentation for many years, but only got around to trying it when a recipe appeared in the June issue of Field & Stream magazine, which I subscribe to. The basic cooking method is a breeze and could easily be prepared onboard a boat or at camp. It is a show stopper when placed on the dining table, both in terms of the beautiful presentation and in terms of the incredibly moist, flavorful fish that results. 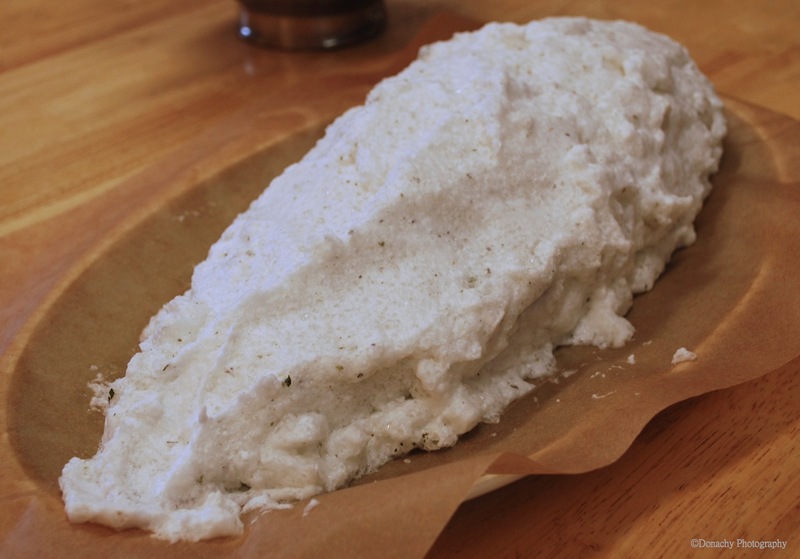 Encased in salt and egg white paste, the fish is ready for the oven. While I had on hand a two pound yelloweye rockfish (Sebastes ruberrimus) which was perfect for this recipe, there are many fish which would work as well. The first that comes to mind are the true porgies – fish in the genus Pagras and Acanthopagrus. In Britain, these fish are commonly known as sea bream. In Japan, they’re are known as tai, and I would love to place a whole salt-crusted madai or kurodai on the table for Japanese guests, who typically revere these fish. Snapper, walleye, striped bass, pompano, black sea bass and even a firm-fleshed Coho salmon would all work well. A halibut just small enough to fit on a large oven tray and served this way would surely draw oohs and aahs. About a half an hour later, the fish is ready to serve. Keep in mind that the best fish dinners start with the freshest fish possible. Good fish should smell as fresh as the sea they came from. Sadly, most American grocers still haven’t figured this one out, so if you’re having trouble finding good fish, try to locate a Japanese grocery store or an Asian market that sells to Japanese customers. Whole Foods and specialty butcher shops also usually carry quality, fresh fish. Costco, too, sometimes carries whole fish and can generally be depended on for a fresh product. Voila! The dull side of a knife is used to crack and remove the crust, revealing a succulent fish that wants only a drizzle of olive oil and a squirt of lemon. Figure about one pound of cleaned, gutted whole fish for every two diners. Thus, a two-pound fish will serve four. All you really need are the first four ingredients. The others are optional and can be omitted entirely or substituted freely. Use paper towels to pat the fish dry. Use a brush (a clean tooth brush works well) to remove all traces of viscera from the stomach and head cavity. Rub cavity with salt, pepper and crushed tarragon, if desired, or place a sprig or two of fresh tarragon in the cavity. Stuff with the shrimp. Set fish aside. Whip the egg whites until they from stiff peaks. Gently fold the salt (and the crushed bay leaves and marjoram, if desired) into the egg whites until a paste is formed. Spread about 1/3 of the salt paste on the parchment paper in a shape large enough to hold the entire fish. Place the fish on the salt paste and completely cover with remaining salt paste. Bake for 25 minutes. Turn oven off and continue baking for five minutes. Remove fish from oven, place on dining table and allow it to rest for another 5 to 10 minutes. Remove crust by cracking it open with the dull side of a knife. The crust can be lifted off with a spatula, large spoon or wide knife blade. The top layer of the fish will easily lift away from the bones. Serve with lemon wedges and drizzles of extra virgin olive oil. We served the fish with oven-roasted potatoes and steamed vegetables. This dish would be fun with Margaritas. Oh my god! Can’t wait to try this. Will wait till we get a whole fish next time! Any size that will fit into your oven will work. Two egg whites to 1 cup of salt, and 1 cup of salt per pound of fish – although it doesn’t hurt to use more salt. Looks sooooooo good! There is nothing like fresh, moist fish!